Strange Days: A poltergeist in Kent? 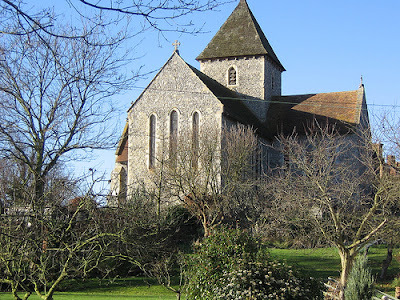 Adisham is a small country village in Kent , located between Dover and Canterbury. The village is located on the Pilgrim's Way, an ancient trackway adopted by pilgrims on their way to the shrine of Thomas Becket , at Canterbury. 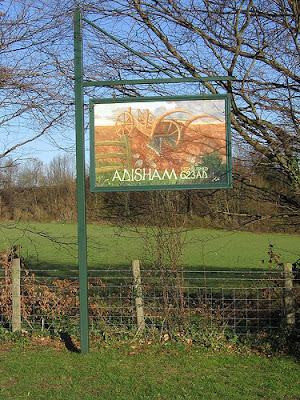 Adisham was also mentioned in the Domesday Book , when it was known as Edesham. Joe and June Orchard lived at 3 Church Lane, next to Adisham's thirteenth century church. They had lived there peacefully since 1953, and it had been their son David's only home. Their tranquility was shattered in November 1976, when a terrifying and incredible sequence of events began. The first indication of abnormal events, was when electrical equipment misbehaved. Lights would suddenly dim, and domestic appliances would turn themselves on and off. This was initially blamed on faulty equipment and wiring. One day, David discovered a pool of water on the living room floor. It was raining, so it was assumed to be from a leak. But when David tried to mop it up, water kept appearing, faster than he could mop it up. When Joe arrived home, he spotted water on a wall behind the radiogram. Subsequent investigation showed the radiogram to be full of warm, smelly water. A builder blamed the incident on a suspected breach in a down pipe just outside the window. Investigations revealed there had been no such breach. The unexplained deluge continued inside 3 Church Lane, until about 2.30 am, by which time, one of the cottage walls was saturated. By 7.00 am, the phenomenon had started again, and the ground floor of the cottage was under three inches of water, despite the rain having stopped. A plumber arrived but could not find the water's source. Meanwhile, water continued to appear, except as the day wore on, the water became steaming hot. During the mopping up, the family moved a table to the middle of the living room. They piled several items on top of it. They heard a hissing sound, and to their horror, the table levitated some six inches off the floor, before slamming back down. The next problem they encountered was water inside electrical fittings. They called out an electrician from the utility firm Seeboard. He found a serious short in a protective multiple earthing (PME) pole in the garden. He reported to his superiors. A foreman arrived the next day. He tested the external wiring and the internal circuits. Even when the circuits were isolated, the meter displayed erratic forward and backward movements. There were four independent witnesses to this phenomenon. Despite this alarming and bizarre finding, Seeboard declared they could do nothing about it, or the water problem. They even suggested these occurrences were a result of a hoax perpetrated by David. Desperate for help, the Orchards called in Kent Police, who contacted Seeboard on their behalf. Seeboard told the police they believed water had been thrown onto the electrics by human hands. Their theory failed to account for the fact that huge volumes of water were involved, and could be seen streaming out of the cottage and down Church Lane. However, the police concurred with Seeboard, and David, once more, came under suspicion. The police accused the Orchards of being blind to their son's mischief, and choosing to insist that occult forces were at work. The Orchards, in fact, blamed Seeboard and the faulty PME for the strange events. By the end of the year, the Orchards were at the ends of their tethers. They knew David could not be responsible for the electrical and water phenomena. How could he interfere with the electrics, and hurl around several gallons of water, right under their noses, without being detected? And how was he able to cause erratic meter readings, even when the power supply was off?Just before Christmas, a metal plate suddenly shot off the gas cooker and flew across the room. The Orchards had seen enough. They initiated legal action against Seebord. The water incidents continued, some severe, others less so, until the following summer. When the water stopped, the phenomenon took on a new and terrifying aspect. An unseen force hurled a pair of scissors across a room. Glasses were thrown from a cabinet and smashed against a wall. Beds and other furniture were upended and thrown around. The unseen force hurled the gas cooker onto its side and ripped pipes out of walls. A powerful force would hold the upended items in place, and they could only be righted when the force released its grip. Strange things also happened outdoors. Tools, buckets and a variety of other loose items around the garden, would suddenly shoot up in the air. They would be drawn by a powerful and unseen force, to the top of the PME pole. They would remain there until, like the household items, the force released them. The sudden kinesis was not restricted to metallic objects. Such was the violence of the force, that neighbours were forced to install protective mesh over their windows, after a brick was hurled through one. June and David were outside at the time, talking to the neighbour in question, so there was no question of David being responsible. By the end of July 1977, the phenomenon rendered the cottage uninhabitable. Its ceilings had fallen in, and doors and windows had been blasted. The Orchards were forced to seek alternative accommodation. The case rumbled on for several years, during which time, expert witnesses for both sides thrashed it out. Unfortunately for the Orchards, their expert witness, a professor of engineering, was also a former president of the Society for Psychical Research. Despite the fact that he was carrying out a scientific, not a paranormal investigation for the Orchards, he was deemed biased and not allowed to enter evidence in court. This was despite Seeboard's expert witness conceding that heavy ground currents could have caused steam and hot water to be forced through the floor of 3 Church Lane. Seeboard's expert also explained that alternating current could lead to the production of highly volatile gases, and their explosion could cause some of the phenomena witnessed at the cottage. The case finally came before Mr. Justice Steyn, at the Royal Courts of Justice, in March 1985. Despite being backed up by the testimony of a large number of independent witnesses, the Orchards lost the case. The judge accused the Orchards of dishonesty in their testimony. Although he accepted the sincerity of the witnesses, he doubted their reliability, and considered many to be "prone to suggestion". It seemed no-one was prepared to believe the Orchards' plight, because they had been labeled occult believers and kooks, by nonplussed electricians and police officers. This was despite the fact that the Orchards themselves blamed Seeboard, rather than any paranormal phenomenon, such as a poltergeist . So what really happened at 3 Church Lane? Was the electricity supply at fault? Seeboard had never witnessed such events before, and remained adamant that human intervention was behind the strange phenomena. Were the Orchards deluded or perpetrating a hoax? Or was there an even more sinister explanation of events? Their experiences have all the hallmarks of a poltergeist presence. But then again, exactly what causes poltergeist activity ? Many reliable witnesses the world over, have witnessed poltergeist disruption, some of which has been caught on camera. Yet there is nothing to explain poltergeist activity. Is it, as some suggest, the work of malevolent spirits, or the energy generated by a disturbed living mind? Or maybe it really is caused by a faulty electricity supply? For a more extensive account of this story, visit the Fortean Times website and read Bill Love's article, upon which this account is based.